Pre-sliced cheese just doesn’t cut it; not when it’s this easy to cut your own. 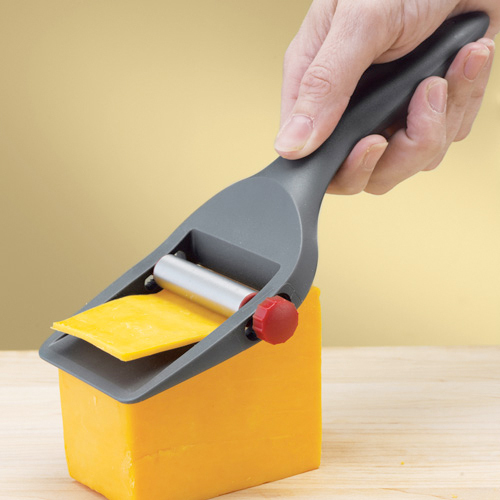 Featuring the ability to cut slices in four different thicknesses (up to a quarter-inch), the Cuisipro Adjustable Cheese Slicer makes quick work of block cheese. The simple 9-inch by 3-inch kitchen gadget adjusts with a turn of the knob, while the roller acts as a guide. With an ergonomic handle, the prep tool glides over cheese, providing ready-to-eat slices without the need to sacrifice quality.